Pic shows Cliodhna Costain (centre) with her niece Doireann and brother Karl. Cliodhna married in the church in 1970 and came back from the Isle Of Man where she now lives for the Mass in the Church of the Annunciation on Sunday morning celebrated by Archbishop Diarmuid Martin. Pic John Mc Elroy. 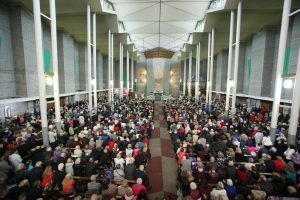 “It’s the people that make a parish”, Fr Eamann Cahill said on Sunday at the Church of the Annunciation in Finglas West at the last Mass before the church is demolished. The parish priest described Sunday as a celebration “as we embark on challenging times ahead”. He said the soon to be demolished church, which was opened by Archbishop John Charles McQuaid in 1967, had served the parish well. The new church will cater for roughly 350 people, and will also house a parish office, sacristy and a pastoral centre. “Some might think of today as a sad day, in some ways maybe it is. But we need to look forward with a sense of joy and anticipation of what the future will hold for us. We are very lucky that Finglas West has such a strong sense of community spirit. It’s the people that make a parish,” Fr Cahill said. The parish is currently negotiating with Dublin City Council on how best to use the land that is freed up by the demolition of the church. Róisín Shortall, deputy leader of the Social Democrats and TD for Dublin North West, told CatholicIreland.net that the plans included, in addition to the smaller church, housing for the elderly and a HSE primary healthcare centre. The people of the area have been looking for a site for a primary healthcare centre for years she said and added it was “badly needed” because of the lack of GPs in the area. “I would hope that by the middle of next year there would be evidence of work on the site,” she said. The TD for the area said Sunday was “a sad day from the point of view of the building closing” as there are “so many memories bound up in the building”. Dublin’s Lord Mayor, Cllr Nial Ring, said the proposal for housing on the site would allow elderly from the locality to downsize and free up two and three-bedroom houses for younger couples. “Everyone is a winner in this,” he said. “It was a sad occasion, but it was also a celebration,” he said and added, “What struck me was the amount of people, when the Archbishop asked how many people in the congregation had been in the church on its first day – the amount of hands that went up. One of the local family groups that turned out in a show of solidarity was the Walsh family of six sisters and one brother. Eldest sister Marie made her communion in the “little tin church” which preceded the massive 1967 church opened by Archbishop John Charles McQuaid. Gerard, Marie, Brenda, Louise, Pat, Deirdre and Denise all had their communions, confirmations and weddings in the 51-year-old church. “It is a very sad, emotional day. Our parents were buried from here; we all got married from here; our babies were christened here,” Marie Walsh explained. Fr Paddy Kelly was a concelebrant at Sunday’s Mass. He works with the Traveller community on the north side of Dublin. He paid tribute to the Finglas West community for having made the large contingent of Travellers in the area welcome. “This is the parish a lot of Travellers come to. There has been very little tension between Travellers and settled people in Finglas West, there has always been a good relationship between them because they went to school together and grew up together. 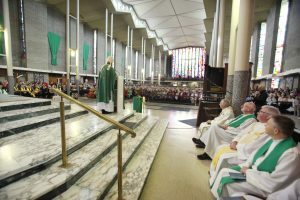 Archbishop Diarmuid Martin gives the homily at mass in the Church of the Annunciation for the last time. Pic John Mc Elroy. Parishioners will now attend Sunday Mass in St Fergal’s school, while weddings and funerals will take place up in St Canice’s in Finglas village until the new smaller church is built. 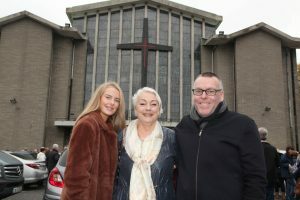 Sixty-eight-year-old Cliodhna Costain travelled over from the Isle of Man specifically to attend Sunday’s Mass. Each of her three children were christened in the Church of the Annunciation and made their communions there. Then the family moved to the Isle of Man, but her mother and grandmother were both buried from the church.